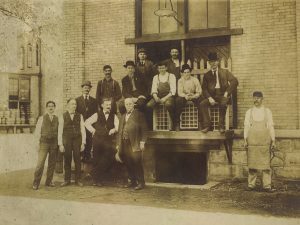 In 1907, the Olean Brewing Company built a state-of-the-art brewery on the corner of Green & Barry Streets to supply the Olean area with fine beer. It was open for 13 years until its demise due to prohibition. 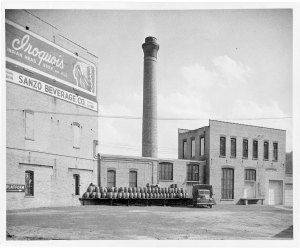 Now, over 100 years later, we have brought this brewing complex back to its original purpose. Below, is a description of the brewery and the biography of the man who created it. Olean.- The new plant of the Olean Brewing Co. will be one of the finest and most modern in this country, and though the courtesy of the brewing company we are able to give in the following an illustration and description of this plant. This brewery, with its prominent artistic features, is beautifully located on the corner of Green and Barry streets and adjoins the Allegheny River in the rear. The brewery proper is along the Pittsburgh, Shawmut & Northern Railroad, and equipped for a yearly output of 25,000 bbls, and has an artificial ice plant of 20 tons daily capacity. The buildings are grouped in such a way as to permit a very convenient and economical operation of the plant, at the same time ample space is left around the buildings so that everyone can increase in the proper direction without interfering with existing business. The arrangement of the whole brewery is very compact, every wall being used twice, which has brought the whole plant to narrowest limit of space and cost, but at the same time it is very commodious. Every room in the building is sufficiently lighted and ventilated, and the best sanitary conditions are obtained. The brewhouse is equipped a 100-bbl kettle outfit. The stockhouse has 5,300 bbls storage capacity. The bottling house contains the most modern bottling house machinery of 6 bbls daily capacity, driven by direct connected motors. The office is prominently located at a street corner, has a spacious lobby, private office, agents” room and vault on the first floor, and a meeting room in the second story. The buildings are all of good substantial construction with concrete foundations, brisk walls with pressed brick facing and cut stone trimmings, concrete floor arches between steel beams and have asphalt finish. The different machines are driven by direct connect motors and electricity is generated by a 35K.W. direct connect generator. The copper and tank work is furnished by the George E. Laubenheimer Co., of Chicago; the machinery and millwright work by Olsen & Tilgner Mfg. Co., of Chicago; the refrigerating machines and ice plant by the Vilter Mfg. Co., of Milwaukee; the generator, engine and motors by the Russel Engine Co., of Massilion, OH. The cooperage will be furnished by the Hauser, Brenner & Fath Co. of Cincinnati. The cork insulation has been furnished by the Armstrong Cork Co., of Pittsburgh. 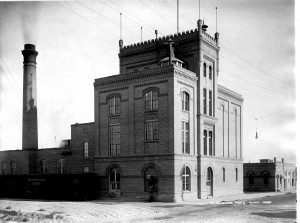 The plans and specifications for this brewery have been furnished by B. Barthel, the well-known brewery architect of Chicago, under whose personal supervision the plant is being erected. Henry Sigel, son of John Jacob and Julia (Klocke) Sigel, was born in Buffalo, New York, March 2, 1863. He received his education in the public schools of that city and at St. Mary’s parochial school. He began his active business career as a cash boy in a department store. He later learned the trade of undertaker, in which line of work he was engaged in Olean for seven years, from 1880 to 1887. Among other things he is interested in the operating and producing of oil in the Pennsylvania fields, and is actively connected with the Pittsburgh, Shawmut & Northern railroad in the capacity of claim, real estate and tax agent. In the year 1907 he organized the Olean Brewing Company, erecting a fine brewery and manufacturing a high grade of goods for the local trade. The officers of the company are as follows: Henry Sigel, president; John T. Howard, vice-president; Joseph Kaye, treasurer; Colonel J. M. Homer, secretary. The company has a capital of $150,000 and the plant occupies extensive buildings at Barry and Green streets, constructed of Shawmut pressed brick, and covering about two and a half acres. The office building is entirely separate and is elegantly furnished. The brewery, one of the finest in the country, is fitted with the most modern machinery and is operated by electricity and gas; there is a modern ice plant with a capacity of eighty tons a day, finely equipped to supply the commercial and family trade. In connection with the brewing plant is a thoroughly appointed bottling establishment and when in full operation the works have a capacity of thirty thousand barrels of “Olean Beer,” as it is known. The establishment is under the supervision of Colonel James M. Homer as manager, and Brewmaster Conrad Buehl, who has been engaged in this business for nearly twenty years, and whose father before him wasan expert in the art of beer making. From thirty to forty skilled men are employed under them, and in the manufacture of the product only the best of malt, hops and rice are used, and the purest of water and yeast. The result is a beer of the highest possible quality, pure, wholesome and delicately flavored. All the officers of the company are men of prominence and high social standing in the community, closely identified with the commercial, financial and public life of the city. Mr. Sigel took up his residence in Olean, New York in 1878, and for many years has been active and prominent in its public affairs. In 1887 he became connected with the police department, remaining until 1891, when he was appointed by W.B. Hughes to the position of under-sheriff, and he acted in this capacity up to 1894, when he was the candidate for the office of sheriff and was elected, serving from 1895 to 1898, and at the expiration of his term he again became under-sheriff, under W.H. Hazard. He discharged the duties of the office of under-sheriff with fidelity and impartiality, year by year constantly growing in public estimation. At the age of twenty-one years he attended the state convention at Buffalo as delegate and voted for Warner J. Miller for governor, and also acted in the same capacity in the convention that nominated Theodore Roosevelt for the governorship. He is an ardent advocate of the principles of Republicanism, and is an earnest and consistent member of St. Mary’s Roman Catholic Church. Mr. Sigel is one of the most substantial and enterprising citizens of Olean, wielding and influence for good in the community. By his own honorable exertions and moral attributed, he carved out for himself friends, affluence and position, and by the strength and force of his own character has overcome obstacles which to others less hopeful and less courageous would seem unsurmountable. His mind is ever occupied with projects for the advancement and welfare of his adopted city. Fortified with a keen, resourceful mind, excellent judgment and rare foresight, his energy is inexhaustible. Scrupulously honorable in all his dealings with mankind, he bears a reputation for public and private integrity, and being sociable and genial, he has a wide circle of friends. He responds liberally to all calls for charity, giving of his time and means for alleviation of distress. When he enlists in a cause he never withdraws from the conflict until the trouble ends, and it is due to his force and resource very largely that the vaccination trouble in Olean was brought to a close. He could occupy a prominent position in politicalleadership were he so disposed, but he would rather devote his time and attention to other lines of activity. Mr. Sigel married, August 19,1884, Mary E. Lang, born August 10, 1864, daughter of Nicholas and Phillysine Lang. Children; Clara Frances, Florence Marie, Dolores Marie.